The AW-RP120G Remote Camera Controller supports a variety of Panasonic remote camera systems. IP connection allows a large-scale, flexible, and simple system configuration for controlling up to 100 remote cameras and the simultaneous use of multiple controllers. 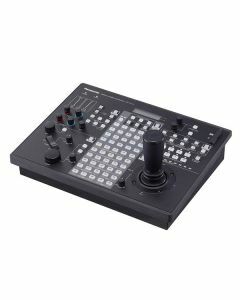 A new joystick enables high response pan and tilt operation, and a newly designed control panel adds color adjustment dials. A preset memory with a new batch recall function and tracing memory save labor by allowing single-person operation. Equipped with Paint and other camera adjustment functions, the AW-RP120G meets a wide range of high-end needs. It is the ideal all-in-one controller for many applications such as event, conference hall, public facility, wedding and broadcasting use. N.B. The AW-RP120 is not supplied with a power adapter, which must be bought seperately.